The scenes of the child vampires floating outside of their victims' windows was partly filmed in reverse to give it a more eerie effect. Additionally, the actors performed on a boom crane rather than being suspended on wires. Halloween just wouldn't be the same without a good Stephen King picture. 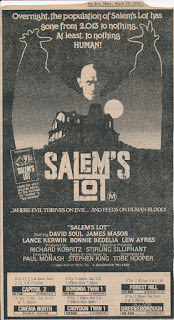 I had just finished reading Salem's Lot and thought that I would check out the television mini-series as well. It has actually been pretty hard to find. There are a lot of different versions of this movie too. Apparently, Stephen King himself loves the cut-down theatrical version. However, I found a near three and a half hour version. I think it is the actual Television version. It has fades for commercial breaks. Either way, I dug it. 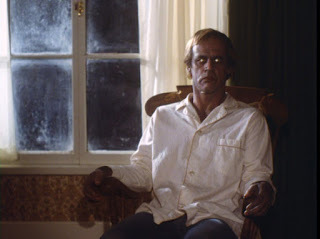 Ben Mears, a writer, returns home to Salem's Lot after many years away. He has had this fascination with this dirty old home in town, The Marsden House. Where, as a child, he had seen the owner decrepit and decaying, hanging by the neck. This image stays with him for a long time. It actually turns out that Ben is returning home when a mysterious old figure is moving into the house. Also people are going missing and being stricken ill all around 'the Lot'. 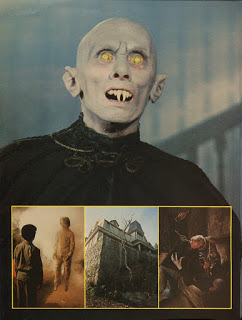 While this is a vampire movie it doesn't explicitly show any nefarious acts. Instead, before anything actually happens we get a well timed freeze frame. It adds to that tone of dread that hangs over the movie. That heavy feeling of fear is what make this a successful movie. There are scenes that make you hold your breath. There are scenes that make you sit on the edge of your seat. All of that, and they give you a good length to tell a full story. They had batted around a lot of scripts from some of Hollywood's best. Larry Cohen and Stirling Silliphant had both turned in their own screenplays. However, this one written by Paul Monash is pretty great. It doesn't follow the book precisely. Instead it makes the movie its own thing and actually improves upon the tale. Horror director extraordinaire, George Romero pulled out of this picture due to it being produced as a made for TV mini-series. Which is a shame. At least we get Toby Hooper of Texas Chainsaw Massacre fame. They didn't need to go into graphic detail in order to make a horrific film. The length of the movie actually made for some really good character development and detail. I was a fan of how in depth they actually got. Unlike some horror movies based on novels, this one actually does a good job. 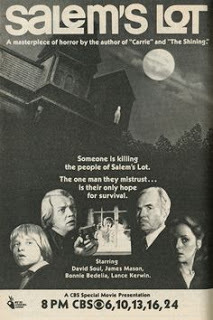 Salem's Lot is a scary picture. Although it has been tamed by the restrictions of the television audience. It still delivers a great deal of suspense and terror. I really loved it. It's long but really interesting and it keeps the pace running well. The horror is great. Its perfect for Halloween movie marathons. I recommend it to anyone that hasn't seen it yet. One of the more forgotten Stephen King classics.